The United States Defense Secretary Ash Carter today announced that U.S. troops and military equipment would be sent on regular rotations in the Philippines, and said the two countries had started joint patrols in the South China Sea amid increasingly assertive territorial claims by China. The rotating forces also willinclude 200 USAF troops who will operate out of Clark Air Base on Luzon Island and would be deployed before the end of April. 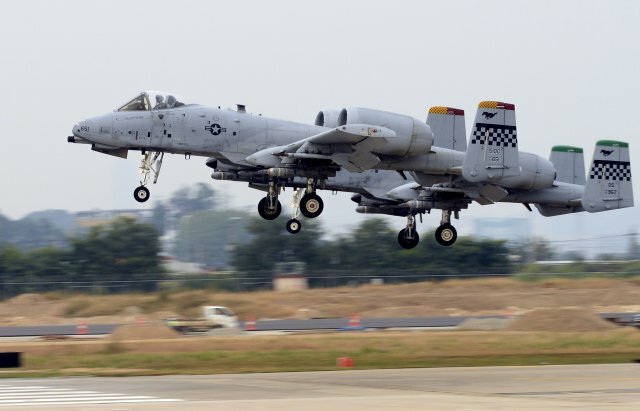 The 200 U.S. airmen will deploy from various bases in the Pacific to support five A-10C Thunderbolt II attack aircraft from the 51st Fighter Wing at Osan Air Base, in South Korea; three HH-60G Pave Hawk helicopters from the 18th Wing at Kadena Air Base, Japan; and a MC-130H Combat Talon II special operations aircraft. In addition, up to 75 U.S. troops, mostly Marines, would remain in the Philippines "on a rotational basis" after the conclusion of "Balikatan" U.S.-Philippines joint military exercises this week. In March, the U.S. announced it would rotate troops to the following five Philippine bases: Antonio Bautista Air Base, Fort Magsaysay, Lumbia Air Base, Basa Air Base and Mactan-Benito Ebuen Air Base. An announcement which directly follows the approval by the Philippine court of the Enhanced Defense Cooperation Agreement, signed by the two sides in 2014.